SKPKC Jayapura staff organised a meeting in the Juk-Lereh church which was attended by around 20 employees of PT Sinar Mas. The meeting was a response to the Taja parish priest Hendik Nahak’s request to address problems facing workers at Sinar Mas’s oil palm plantation. Father Hendrik explained that there are quite a few problems that occur in the oil palm plantation, but they are covered up by the company. The problems relate to, for example, workers’ rights, recruitment, clean water and habitable accommodation. Father Hendrik’s explanation was confirmed by the workers present in the meeting. They made clear that these problems had been ongoing for some time and were frequently ignored by the company. Problems that often arise include recruiting company workers by using supervisors who find the workers, making all sorts of enticing promises. People who want to work for the company are asked to sign agreements to accept all company decisions concerning their wages and other working conditions. There are also problems concerning housing and clean water. The company brings new workers to the site without taking their accommodation needs into consideration, meaning that 3x3m2 houses are being inhabited by two or even three families. People have to rely on rainwater for their everyday clean water needs because the nearby river is polluted by fertilizer which is sprayed by aeroplane. Then when wages are paid, money is docked without explanation, meaning that quarrels sometimes break out between workers and supervisors. Turquoise waters … the Kawe Island coral reef. Australia’s lust for minerals threatens a marine wilderness, writes Tom Allard in Jakarta. About once a month, a ship from Townsville makes the long journey to Raja Ampat, a seascape of astonishing beauty and diversity. In the far western reaches of the island of New Guinea, where the westerly currents of the Pacific flow into the Indian Ocean, hundreds of improbable, domed limestone pinnacles rise from the sea, encircling placid, turquoise lagoons. Fjord-like bays cut deep into the hinterland of mountainous islands, framed by vertiginous jungle-clad cliffs that drop steeply into the water. There are oceanic atolls, shallow bays with fine white sand beaches, snaking rivers and mangrove swamps. Wayag Island is one of the islands within the Raja Ampat district in the province of West Papua. The island is known for its beautiful atolls and amazing underwater life covering a total area of 155,000 hectares. If the numerous islands and countless shoals and reefs of Raja Ampat take the breath away, they only hint at the treasures below. This remote part of West Papua province in Indonesia is the world’s underwater Amazon, the hub of the world’s marine biodiversity, home to 75 per cent of its coral and 1500 fish species, including huge manta rays; epaulette sharks that walk on the sea floor with their fins; turtles and an array of weird and wonderful fish.Yet the vessel that makes the regular trip to and from Townsville does not bring tourists or divers. There are no scientists on board to study this marine wonderland. Rather, the vessel carries tens of thousands of tons of the red clay soil, rich in nickel and cobalt, which is destined for the Yabulu refinery owned by one of Australia’s richest men, Clive Palmer. 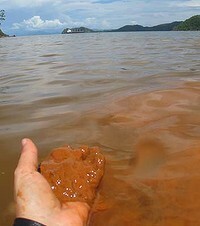 Sediment run-off from mining on Kawe Island. Conservationists and marine scientists say this mining activity and the prospect of more exploitation puts one of the world’s most precious ecosystems under threat. As the environment is imperilled, the impact on local communities has been devastating. Once close-knit villages are divided as competing mining companies offer financial inducements to residents for support. And, in a sadly familiar tale for the Papua region, where separatist sentiments linger, the benefits of exploiting its resources are largely flowing outside the region. Derisory royalties go to landowners and minuscule salaries are paid to locals who gain employment. ”I’m appalled by what’s going on,” says Charlie Veron, the former chief scientist from the Australian Institute of Marine Sciences, who has surveyed the region on many occasions. The vessels sent to collect the nickel and cobalt for Palmer’s Queensland Nickel company dock at Manuran Island, where the mining has continued unabated despite a decree by the West Papua governor, Abraham Atururi, banning all mining activity in Raja Ampat. ”The mining started in 2006. There were protests but the military and police came and they stopped them,” says Yohannis Goram, from Yayasan Nazareth, a local group that opposes mining. The operator of the mine, PT Anugerah Surya Pratama (PT ASP), has promised environmental safeguards, but according to one local from nearby Rauki village they are ineffective. The strip mining for nickel leaves the landscape barren and the steep cliffs of Raja Ampat’s islands mean heavy rainfall overwhelms the drainage systems and sends the heavy soil into the water. Photos taken from Manuran and supplied to the Herald show murky water and dead coral after heavy rain. PT ASP, based in Jakarta, owns PT Anugrah Surya Indotama (PT ASI), another mining outfit that operates on Kawe Island in Raja Ampat, despite a court order to desist due to a conflict over mining rights with a West Papua-based company. The ultimate ownership of the companies are a mystery, although West Papua is rife with speculation that senior politicians and military figures have a stake in them. That is easy to understand, as the Jakarta firm seems to have extraordinary pull at the highest levels of government in Jakarta and Raja Ampat. The rival mining company PT Kawei Sejahtera Mining (PT KSM) is owned by a local man, Daniel Daat. When it began loading its first shipload of nickel at Kawe in 2008, PT ASI, which also claims a mining licence for Kawe, complained. Three gunships and a plane were deployed to stop the consignment and Daat was thrown into prison. The mines at Manuran and Kawe are guarded by military and police who locals say are on the company payroll. And while 15 mining companies have been pushed out of Raja Ampat after the governor’s decree, PT ASP and PT ASI have stayed. Korinus Ayelo is the village chief of Selpele, which has customary ownership of Kawe, and supports Daat’s PT KSM. But PT ASI engineered the highly contested elevation of another chief, Benyamin Arempele, who endorsed its right to mine. Repeated legal cases have found in favour of Daat, but PT ASI continues to develop its mine and conduct exploration. ”They are still working today, guarded by the police,” Ayelo says. Villagers who were previously close now don’t talk to each other. At the very least, the two companies appear to have a cavalier approach to doing business in Raja Ampat. Police documents obtained by the Herald reveal the company allegedly bribed the bupati (regency head) of Raja Ampat, Marcus Wanma, to gain mining licences. Wanma was paid $36,000 to issue the licences in 2004, and a further $23,270 for ”entertainment” purposes, the report said, citing police interviews with 16 witnesses, including Wanma’s staff and Yos Hendri, a director of PT ASI and PT ASP. The report finds that about 670 million rupiah (then worth about $122,000) was paid to Wanma in 2004 for nine mining licences and only 197 million rupiah deposited in the regency’s bank accounts. ”The rest of the 500 million was used for the personal interest of [official] Oktovanius Mayor and Marcus Wanma” the report says. Wanma escaped prosecution and remains the regency head. He has been incapacitated with a serious illness and is believed to be recuperating in Singapore. He was unavailable for interview and Raja Ampat officials declined to comment. Whether the licences were corruptly obtained or not, the sum paid for them is derisory. The open-cut mining undertaken on Manuran is cheap and low tech. After clearing the vegetation, workers simply dig up the soil, haul it into trucks and take it to the docks, where it is sent for processing to extract pure nickel, used in stainless steel. The mine’s wharf is nothing more than a tethered barge with no cranes. Costs for the company consist of little more than maintaining about 40 trucks, heavy moving equipment and the simple wharf. Villagers and employees say most of the mine’s labourers earn between $170 and $200 a month. 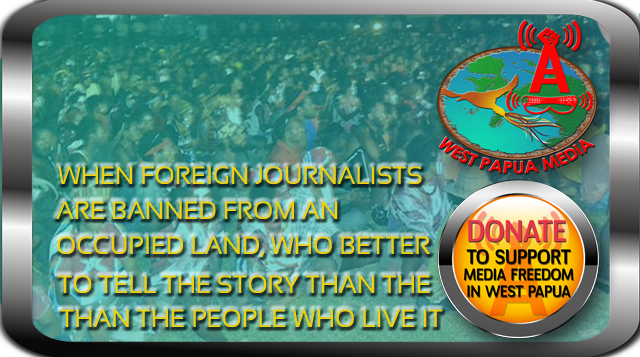 Customary landowners receive a royalty, but an investigation by the Herald has discovered that it is tiny. Soleman Kein, an elder from Kapidiri, a village with customary rights over Manuran Island, says a new deal was negotiated last year increasing landowners’ share of the mine’s income from 1000 rupiah (11¢) a tonne to 1500 rupiah a tonne. An industry expert with knowledge of Raja Ampat’s high-grade nickel laterite ore deposits says PT ASP would have been getting between $US40 ($37) and $US100 a tonne, depending on the fluctuating world price. The average would be about $US60 a tonne, he says. At that price, a single 50,000-tonne shipload earns the miner $US3 million. The mine at Manuran Island typically sends at least two shiploads a month. On those figures, the locals are getting less than a 0.3 per cent share. Hendri, a director of both PT ASI and PT ASP, pulled out of an interview at the last minute and declined to respond to detailed questions. But one source intimate with the Manuran operation and the compensation deal says the local government gets another 3000 rupiah a tonne, and a further 2000 rupiah per tonne was devoted to infrastructure. All up, the insider says, about $200,000 has been spent on local villagers in royalties and infrastructure since 2007. In that period the company has earned more than $150 million from sales, although between 4 per cent and 5 per cent of that revenue should flow back to the central government’s coffers. Some of the villagers are happy with the arrangement. Soleman Kein is delighted with his new house, paid by the infrastructure fund. ”My house used to be made of sago leaves, but now the company has renovated it, our walls now are made of bricks, we have a roof made of zinc and the interior part of the house is beautifully painted,” he says. But villagers from Rauki say only 10 of 76 homes promised in 2009 have been built. And disputes rage between clans over who gets the money offered by the company. The squabbles have torn apart what were once tight-knit communities. The simmering discontent is ”like a volcano” that ”will erupt one day”, one Rauki native says. Queensland Nickel has a sustainable development policy that strives for ”minimising our impact on the environment” and commits to ”pursue honest relationships” with communities. The company declined to respond to questions. ”We don’t comment on the business of our suppliers,” says Mark Kelly, Queensland Nickel’s external relations specialist. Korwa says companies such as Queensland Nickel should not shirk their responsibilities for the behaviour of their suppliers, given they make considerable profits from the arrangement. ”They don’t have to invest too much in Raja Ampat. They don’t have to be troubled by mining concessions, the way business is done here,” he says. ”But they can still get the nickel”. Oxfam Australia, which runs a mining ombudsman, says there is a clear obligation for companies that process raw minerals to be held accountable for their suppliers. Oxfam Australia’s executive director, Andrew Hewett, says: ”Australian companies need to make sure that they are only buying minerals from other companies that respect workers’ rights, community rights and the environment. If there’s a good reason to believe that a supplier is causing harm, the company should undertake a thorough assessment. Queensland Nickel should be well aware of the issues in Raja Ampat. It bought the Yabulu refinery from BHP Billiton in 2009 when the mining giant pulled out of Raja Ampat, selling its mining rights for the region’s Gag Island, amid concern about the ecological and social impacts of mining. The simmering discontent is not restricted to the villages around Manuran, but is ripping apart others that have been the custodians of Raja Ampat’s wonders for centuries, nourishing the sea and jungle with animist ceremonies. For them Raja Ampat – literally Four Kings – was created by eggs that descended from heaven to rest in the water. Many villagers and conservationists want mining stopped at Kawe and throughout Raja Ampat. Kawe has huge environmental significance. It is close to the stunning Wayag archipelago of karst limestone pinnacles and hosts 20 world class diving sites, as well as breeding grounds for green and hawksbill turtles, and shark pupping grounds. Photos obtained by the Herald show earlier mining activity at Kawe led to the heavy red soils flushing into the sea, covering the reefs, a problem that will get worse once full operations resume. 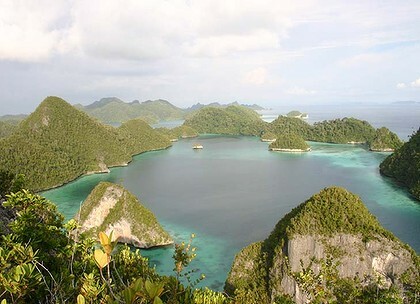 Raja Ampat is theoretically protected by seven marine parks and a shark conservation zone. Controls on illegal fishing are actively enforced, but land-based threats such as mining on nearby islands continues unabated. 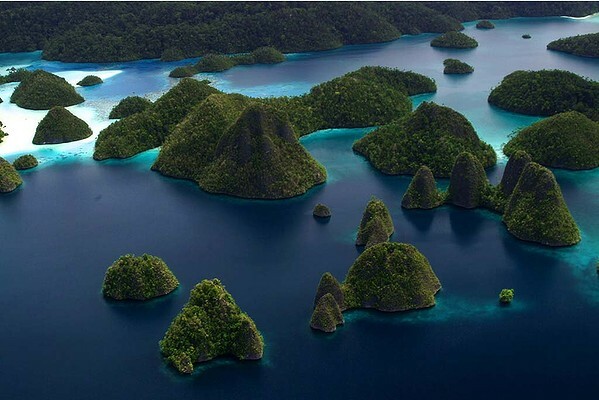 Indonesia’s government has recognised the extraordinary habitats in Raja Ampat. 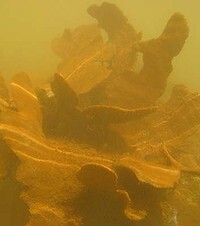 It put the region on the ”tentative list” to become a UNESCO world heritage area, like the Great Barrier Reef, in 2005. But the application has stalled due to government inaction. Many suspect that is because it wants to exploit the area’s natural resources through mining and logging. Raja Ampat’s significance to the world is immense. It is the heart of the famed coral triangle and the strong currents that rush between its islands help seed much of the 1.6 billion hectares of reefs and marine life that spreads from the Philippines across to the Solomon Islands. ”There is tremendous wealth in the natural environment from fishing, pearling and tourism,” Erdmann says, citing a State University of Papua survey that found the long-term benefits from these eco-friendly economic activities outweighed the short-term gains from mining. According to John Kabey, the chairman of KADIN, Indonesia’s Trade and Industry Chamber, Freeport uses all its corporate social responsibility funds for its own security needs. ‘They use it all to finance infrastructure for the security of their operations, including payments to the Indonesian armed forces,’ he said. He was speaking to a group of Indonesian ministers to report on the results of a KADIN seminar. He used the same occasion to declare that Freeport operations in Papua for the past more than thirty yeara have nothing to improve the living conditions of the Papuan people. He said that Freeport operations have only led to friction and conflict between the Papuan people because the various clans with rights to the land used by Freeport are still in onflict with each other. Kabey said that the central government should not use Freeport as an economic resource, in particular because the financial benefits from the company all flow to the central government while those living in the vicinity of the company enjoy none of the benefits. A new NGO, called Lembaga Investasi Proyek Kemanusiaan (LIPK) – the Institute for Humanitarian Investment Projects – has been set up to scrutinise all new companies intending to operate in Papua. The chairman of the NGO is Manase Ugedy Degey. on helping the development of the communities, he said The company’s obligation shall be regularly scrutinised on the basis of frequent investigations. focusing on a wide range of investments, he said. up in accordance with government regulation No 18/1986.